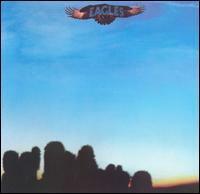 Eagles is the debut album by the rock band of the same name, released in 1972.The album was recorded at London's Olympic Studios with producer Glyn Johns. The album was an immediate success for the young band reaching #22 on the charts and going platinum. The album also released three Top 40 singles with "Take it Easy", "Witchy Woman", and "Peaceful Easy Feeling". The three singles reached #12, #9, and #22 respectively. The album played a major role in popularizing the southern California country rock sound. In 2003, the album was ranked number 374 on Rolling Stone magazine's list of the 500 greatest albums of all time. The single "Take It Easy" is part of the Rock and Roll Hall Of Fame "500 Songs That Shaped Rock and Roll". This album was slated for Quadraphonic release and even given a Quadraphonic catalog number but it was never released in the format.